You can't beat True Image for features, though it has a heavy system footprint. It would be quite easy to simply say that Acronis True Image 2017 New Generation is the best backup program; It’s the fastest all-around imaging program we’ve tested, it’s dead reliable, and it sports every imaginable option. But backup in the real world isn’t about feature sets. While we love True Image in the enterprise or SMB venues, its heavy system footprint and cornucopia of options are likely a wee bit much for the home user. 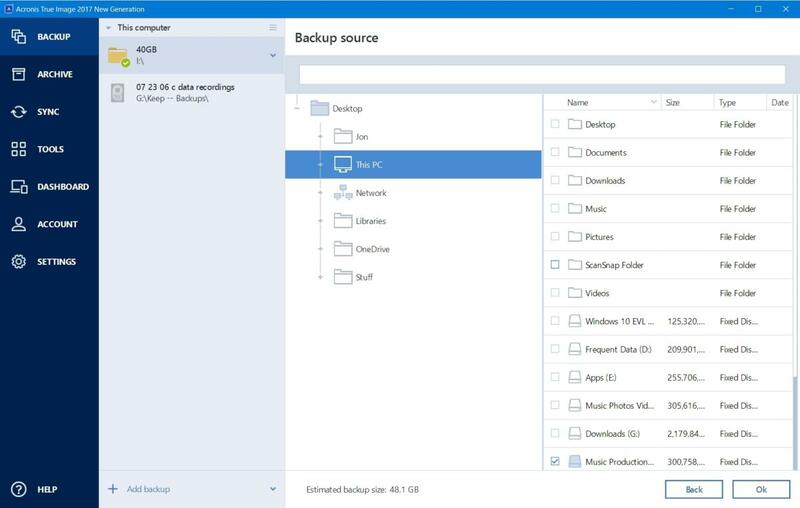 Note: This review is part of our best Windows backup software of 2017 roundup. Go there for details about competing products and how we tested them. True Image 2017 has an attractive interface that’s relatively easy to use—once you’re familiar with it. It’s light years better than it was before a re-design several years ago, but there are still little oddities, such as thin scroll bars with light-colored sliders on a dark background (the exact opposite of the Windows standard) that require more cognitive effort than they should. It’s pretty, but don’t grab the dark portion of the slider—that’s the background. Little time-wasters like this appear throughout the interface. Design oddities or no, True Image 2017 is a titan when it comes to features. In addition to imaging your system, whole disks, partitions, and groups of files, there’s a boot-time startup recovery option and an optional hidden partition for images. There’s every conceivable backup option: incremental, differential, super flexible scheduling, pre/post operation commands, email notifications, just to name a few. There’s also a one-way (mirroring) function for syncing a folder to a destination, as well as client apps for your mobile devices to keep those backed up. Those are just the features in the Essential version, which costs $50. 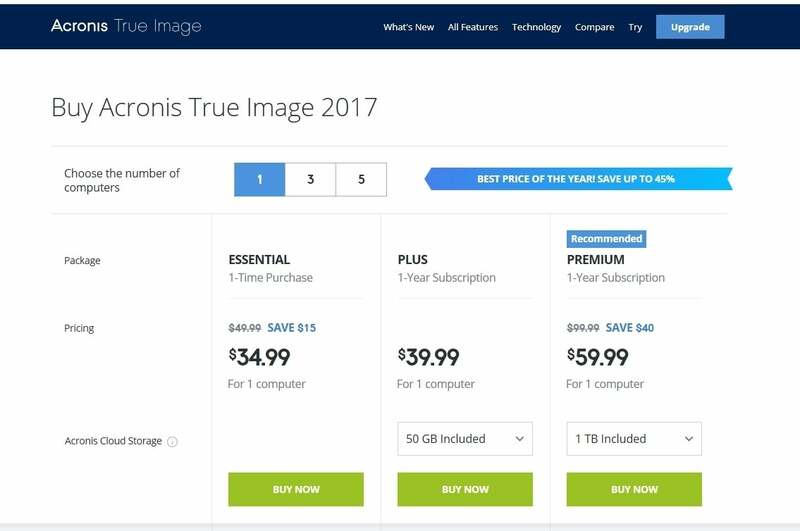 The $40-yearly Plus version offers 50GB of online storage as well as backup of your Facebook page, phone support, and updates. The $100-yearly Premium version ups that to 1TB of online storage plus Active Protection, which checks images and the program itself to see if anything has been altered, to fend off ransomware. Those prices reflect that fact that the Plus and Premium versions are true subscription software—only the restore functions are available if you don’t re-up. $30 will buy you the local backup features in perpetuity. 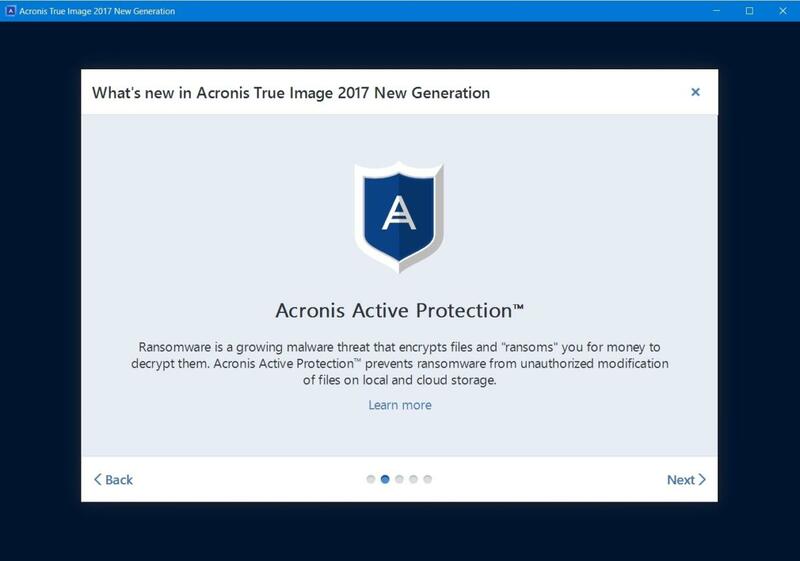 Acronis Active Protection is a hedge against ransomware, but it’s available only in the $100 Premium version. All True Image versions provide bootable recovery media with the ability to restore to dissimilar hardware, i.e., not the same type of hardware that the backup was created on. Be careful buying True Image. When Acronis says subscription, they mean it. A perpetual license is another $30. We run a number of backups and restores with every program we review and True Image aced all of them. It completed our timed small 115GB Windows system backup in less than four minutes, faster than most of the other programs (though several seconds slower than Aomei’s Backupper Standard). But it was twice as fast as Backupper when handling our 48GB mix of files and folders. CPU usage was quite heavy, about 75 percent, far greater than with most programs at their default settings. Speed isn’t a real concern for most users who tend to perform background or after-hours backups. But if you’re backing up a lot of stuff, or from a number of PCs, speed is definitely an asset, and one that True Image possesses in abundance. On the other hand, True Image’s speed and hefty feature set come with a price: a whopping six processes running in the background by default. While any performance hit will largely be unnoticeable in a relatively modern, multi-core system, loading them noticeably lengthened our boot times. There’s a lot of stuff in the system tray as well. We’d very much like the ability to configure True Image to use less resources and keep a lower profile. 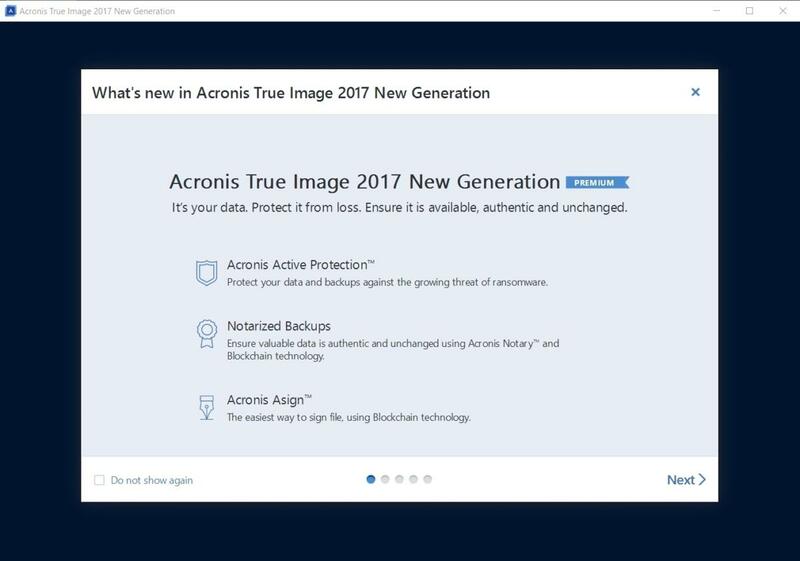 Acronis True Image 2017 excels in some key areas. It’s the fastest overall backup program we’ve tested by a bunch; has just about every feature you could wish for; and offers affordable online storage. And, if you live your computing life dangerously, the Plus and Premium versions offer additional security against ransom-ware. Given the heavy footprint and the expense, it’s best suited for power users, but overkill for pretty much everyone else. We recommend True Image for SMB and pro-sumers, and the anti-ransomware features will be of value to some, but the average user might be better off with something easier and more lightweight.